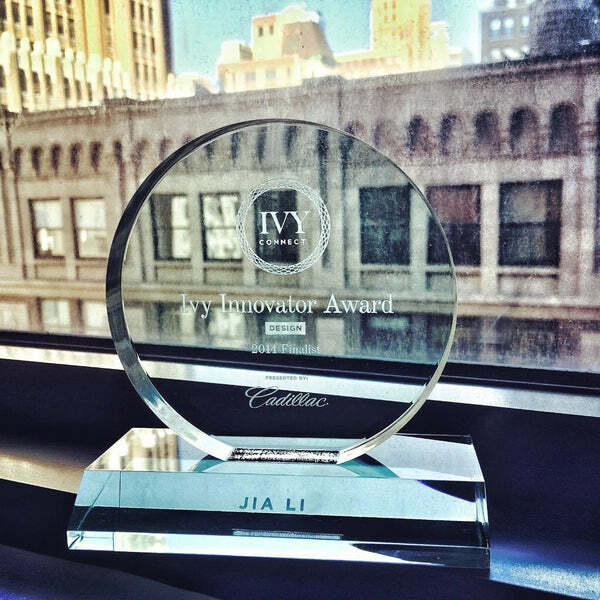 We have some great news from Jia Collection Headquarters on this chilly Wednesday morning: We recently reached the finalist stages of the Ivy Connect Innovator Awards for their design category. We are absolutely thrilled as it’s quite a prestigious award. Our award arrived yesterday (did you see it on our Instagram, Facebook or Twitter accounts?) and it’s oh-so pretty. We can’t stop admiring it. Entry was open to all innovative individuals in the United States. From all of these entries, five finalists and one winner was selected for each of the following three categories: Technology, Film, and Design. All applicants that qualified for the award were evaluated by a Selection Committee, and this committee selected a short-list of entries before whittling it down to the five finalists for each category. So it was quite a tough process and we are delighted we made it through to the final five, especially as we were the only fashion brand to be selected as a finalist. – Dedication to building life-long collaborative bonds. We are so happy that the committee valued our uniqueness, creativity, innovativeness, personal vision, and so much more. We are now even more motivated for bringing you all our new collection. Until then, why not check out our current styles right HERE?